Substitute Carlos Vela scored a vital late equaliser against Stoke to lift West Brom out of the relegation zone. After a forgettable first half Rory Delap profited from some poor West Brom defending to head Stoke in front from a Jermaine Pennant corner. But Vela benefited from a close offside decision to level from six yards only five minutes after he had come on. The Mexican striker almost snatched a winner in injury time but was denied at pint-blank range by Asmir Begovic. The Potters against the Baggies on a dark Monday night in late February offered little for the neutral but though there was a marked lack of quality there was no shortage of incident in the closing stages. The first half was wretched and though West Brom were comfortable with their five-man midfield they offered nothing in attack in the opening half hour, while Stoke, who opted for Kenwyne Jones and John Carew up front, created little themselves. Finally Graeme Dorrans jinked through and tested Begovic with an angled drive and the home goalkeeper also had to be alert to keep out a low shot from Marc-Antoine Fortune when the lone striker cut in from the right. Predictably Stoke's main threat came from the long throws of Delap but Jermaine Pennant, who had an earlier effort from similar distance pushed aside by Scott Carson, beat the goalkeeper with another 25-yard free-kick that clipped the top of the crossbar. But having looked comfortable against the physical threat from Stoke, naive defending ensured that West Brom's failure to keep a clean sheet stretching back to the second game of the season would continue. Delap, so often the provider, was the recipient of a gift as his marker Dorrans slipped and the Stoke midfielder, barely two yards from the goal-line, steered Pennant's left-wing corner into the net with a cluster of defenders looking on. The goal at least sparked some determination from the Baggies, Brunt forcing another save from Begovic with a left-footed drive from 20 yards and Fortune's attempted header looping off his shoulder on to the top of the bar. Vela was introduced with fewer than 10 minutes remaining but he made a huge impact, albeit with a degree of good fortune about his goal. The Mexican striker appeared to be offside when a Steven Reid cross came in from the right but with no flag raised the ion-loan arsenal man was left in the clear six yards out and drilled in the equaliser. In injury time West Brom almost snatched a winner when Begovic made a superb double save, first to keep out a stinging drive then to block Vela's close-range effort from the rebound. But Roy Hodgson's men will go into Saturday's derby at Birmingham only one point behind the League Cup winners and with renewed optimism that they can avoid the drop. 90:00+5:19 The game is over, as the referee blows his whistle. 90:00+5:03 Carlos Alberto Vela takes the chance to get an effort at goal. Asmir Begovic gets a block in. 90:00+4:07 Graham Dorrans takes a shot. Save made by Asmir Begovic. Somen Tchoyi takes a shot. Asmir Begovic makes a save. 90:00+3:11 Robert Huth challenges Peter Odemwingie unfairly and gives away a free kick. Free kick crossed left-footed by Chris Brunt from right channel, Ryan Shawcross makes a clearance. 90:00+3:11 Booking Robert Huth goes into the referee's book. 90:00+1:36 Handball decision goes against Peter Odemwingie. Free kick taken by Asmir Begovic. 90:00+0:21 Jonathan Walters is flagged offside by the assistant referee. Scott Carson takes the free kick. 86:12 Assist on the goal came from Steven Reid. 86:12 GOAL - Carlos Alberto Vela:Stoke 1 - 1 West Brom Goal scored by Carlos Alberto Vela from deep inside the penalty box to the bottom left corner of the goal. 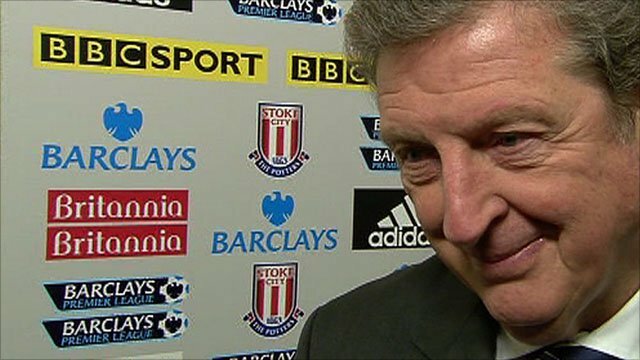 Stoke 1-1 West Brom. 85:12 Free kick awarded for an unfair challenge on Jonas Olsson by Ricardo Fuller. Free kick taken by Jonas Olsson. 84:19 Shot from just outside the box by Somen Tchoyi misses to the left of the target. 83:07 Foul by Dean Whitehead on Somen Tchoyi, free kick awarded. Steven Reid produces a strike on goal direct from the free kick. 81:56 Foul by Peter Odemwingie on Robert Huth, free kick awarded. Indirect free kick taken by Asmir Begovic. 81:56 Substitution Ricardo Fuller joins the action as a substitute, replacing Kenwyne Jones. 81:56 Substitution Carlos Alberto Vela comes on in place of Jerome Thomas. 79:09 Free kick awarded for an unfair challenge on Somen Tchoyi by Danny Pugh. Free kick crossed left-footed by Chris Brunt from right channel, Foul by Peter Odemwingie on Asmir Begovic, free kick awarded. Asmir Begovic restarts play with the free kick. 78:01 Jonathan Walters is caught offside. Abdoulaye Meite restarts play with the free kick. 77:39 Somen Tchoyi gives away a free kick for an unfair challenge on Danny Pugh. Direct free kick taken by Asmir Begovic. 77:04 Substitution Glenn Whelan comes on in place of Jermaine Pennant. 75:41 Matthew Etherington is ruled offside. Steven Reid takes the indirect free kick. 72:04 Substitution Peter Odemwingie is brought on as a substitute for Marc-Antoine Fortune. 72:04 Substitution (West Brom) makes a substitution, with Somen Tchoyi coming on for Youssouf Mulumbu. 71:07 Jerome Thomas challenges Jermaine Pennant unfairly and gives away a free kick. The ball is delivered by Jermaine Pennant, Jonathan Walters produces a header from inside the area that goes over the bar. 69:43 Free kick awarded for an unfair challenge on Kenwyne Jones by Paul Scharner. Free kick crossed left-footed by Matthew Etherington. 69:01 Header from deep inside the area by Marc-Antoine Fortune goes harmlessly over the crossbar. 68:08 Jonas Olsson takes a shot. Save made by Asmir Begovic. 67:17 Free kick awarded for a foul by Ryan Shawcross on Marc-Antoine Fortune. The free kick is swung in left-footed by Chris Brunt, Dean Whitehead makes a clearance. 67:17 Booking Booking for Ryan Shawcross for unsporting behaviour. 65:15 Free kick awarded for an unfair challenge on Marc-Antoine Fortune by Robert Huth. Chris Brunt takes the free kick. 64:37 Shot from just outside the box by Jerome Thomas goes over the crossbar. 64:37 Substitution Matthew Etherington replaces John Carew. 63:23 Foul by Rory Delap on Marc-Antoine Fortune, free kick awarded. Chris Brunt crosses the ball from the free kick left-footed from right wing, Jonathan Walters manages to make a clearance. 61:42 Chris Brunt takes a shot. Save made by Asmir Begovic. 59:24 Unfair challenge on Abdoulaye Meite by Kenwyne Jones results in a free kick. Indirect free kick taken by Scott Carson. 58:59 Graham Dorrans takes a shot. Asmir Begovic makes a save. 57:43 John Carew challenges Paul Scharner unfairly and gives away a free kick. Free kick taken by Steven Reid. 57:06 Effort on goal by Jerome Thomas from just outside the penalty area goes harmlessly over the target. 55:18 John Carew gives away a free kick for an unfair challenge on Paul Scharner. Steven Reid takes the free kick. 54:45 Effort from just outside the area by Jonathan Walters goes over the bar. 54:18 Graham Dorrans takes a shot. Save by Asmir Begovic. 52:07 Corner taken right-footed by Jermaine Pennant from the left by-line, assist on the goal came from Jermaine Pennant. 52:07 GOAL - Rory Delap:Stoke 1 - 0 West Brom Rory Delap scores a headed goal from close in. 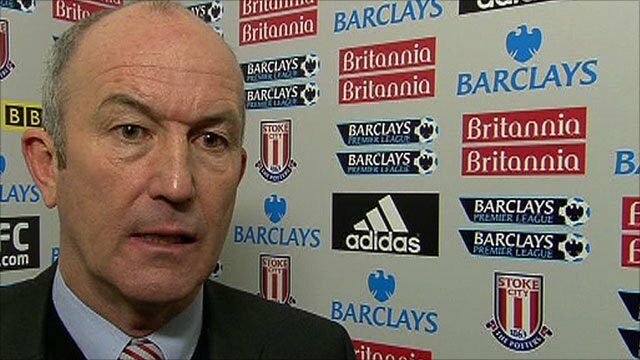 Stoke 1-0 West Brom. 48:26 Jerome Thomas fouled by Dean Whitehead, the ref awards a free kick. The free kick is swung in left-footed by Chris Brunt, Ryan Shawcross makes a clearance. 46:21 The assistant referee flags for offside against Kenwyne Jones. Indirect free kick taken by Scott Carson. 45:00+1:07 The match has reached half-time. 43:19 Rory Delap concedes a free kick for a foul on Graham Dorrans. Chris Brunt produces a cross, Paul Scharner produces a right-footed shot from the edge of the area and misses to the left of the goal. 40:37 Chris Brunt challenges Jermaine Pennant unfairly and gives away a free kick. Jermaine Pennant fires a strike on goal direct from the free kick. 40:37 Booking Chris Brunt is shown a yellow card for unsporting behaviour. 39:03 Marc-Antoine Fortune is ruled offside. Asmir Begovic takes the free kick. 38:18 Jermaine Pennant gives away a free kick for an unfair challenge on Nicky Shorey. Free kick crossed by Chris Brunt, Kenwyne Jones manages to make a clearance. 35:44 Jermaine Pennant fouled by Chris Brunt, the ref awards a free kick. Marc Wilson restarts play with the free kick. 33:31 Danny Pugh challenges Jerome Thomas unfairly and gives away a free kick. Steven Reid takes the free kick. 32:13 Marc-Antoine Fortune takes a shot. Save by Asmir Begovic. 31:02 Unfair challenge on Jermaine Pennant by Chris Brunt results in a free kick. Free kick crossed right-footed by Jermaine Pennant from right channel, clearance by Youssouf Mulumbu. 28:57 Graham Dorrans takes a shot. Save by Asmir Begovic. 21:55 Kenwyne Jones fouled by Youssouf Mulumbu, the ref awards a free kick. Direct effort from the free kick comes in from Jermaine Pennant, save by Scott Carson. 21:55 Booking Youssouf Mulumbu receives a yellow card for unsporting behaviour. 20:19 John Carew gives away a free kick for an unfair challenge on Jonas Olsson. Indirect free kick taken by Scott Carson. 19:54 The referee penalises Youssouf Mulumbu for handball. Dean Whitehead restarts play with the free kick. 18:43 Marc-Antoine Fortune concedes a free kick for a foul on Ryan Shawcross. Free kick taken by Asmir Begovic. 15:23 Free kick awarded for a foul by Kenwyne Jones on Scott Carson. Free kick taken by Scott Carson. 12:54 Marc-Antoine Fortune challenges Danny Pugh unfairly and gives away a free kick. Direct free kick taken by Danny Pugh. 10:34 Unfair challenge on Marc Wilson by Jerome Thomas results in a free kick. Free kick taken by Dean Whitehead. 7:41 Unfair challenge on Paul Scharner by John Carew results in a free kick. Jonas Olsson restarts play with the free kick. 6:10 Marc-Antoine Fortune gives away a free kick for an unfair challenge on Ryan Shawcross. Ryan Shawcross takes the indirect free kick. 4:27 Inswinging corner taken by Jermaine Pennant, clearance by Abdoulaye Meite. Inswinging corner taken left-footed by Danny Pugh played to the near post, Jonas Olsson makes a clearance. Corner taken left-footed by Danny Pugh from the right by-line, Ryan Shawcross takes a shot. Save made by Scott Carson. 3:57 Chris Brunt concedes a free kick for a foul on Jonathan Walters. Asmir Begovic takes the free kick.